Scores of UCT final-year health sciences students and their friends and families jived, cheered and whistled as pamphlets bearing their results rained down from the balcony at the Barnard Fuller Building on 27 November. 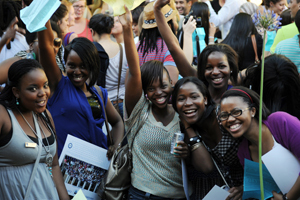 There was a 100% pass rate for the 2012 class qualifying as medical doctors. Nicola Macrobert (make that Dr Macrobert) is the gold medallist in the MBChB graduating class. She also won the Mary Robertson Prize for Excellence, which includes R15,000 in cash. The Mary Robertson Prize for Best Progress (with a cash prize of R10,000) went to Nolukholo Ncete, who comes from a small school in the rural Eastern Cape. She was not successful on her first application to medicine in 2005, but was admitted to her second choice, Speech Language Pathology. Ncete did so well in her first year that she was offered a place in medicine the following year and passed her final year with a grade point average of 71.22%. Professor Mary Robertson, who sponsors these two prizes, is a UCT alumna and eminent neuropsychiatrist. She was the first woman to receive a Doctor of Science in Medicine from UCT, and only the ninth recipient of this honour, rarely awarded and only to persons of “exceptional academic merit” on the basis of original published work. Gold medallists from the other departments are Lee-Anne Arendse in Audiology, Tessa Deboisee De Ricquebourg in Speech Language Pathology, Carolyn De Reuck in Occupational Therapy and Brett Philips in Physiotherapy. The student pass rate in these departments ranged from 79% (Audiology) to 100% (Occupational Therapy). The students will graduate on 12 December.